BRUSSELS — European leaders have been struggling for the last three years to deal with the problem of migration. Yet the issue is as toxic as ever and the politics have become a prime neuralgic danger to the bloc, bringing populists to power most recently in Italy and Austria and now threatening the rule of Madame Europe herself, Chancellor Angela Merkel of Germany. Under a kind of ultimatum from her Bavarian conservative partners to reduce the flow of migrants coming to Germany after registering in other European Union countries, Ms. Merkel got the president of the European Commission, Jean-Claude Juncker, to call an emergency meeting here on Sunday of the European leaders most affected by migration. It is a rare occurrence, in that not every European leader will be there. But it is in preparation for a summit meeting of them all next week — a meeting that was supposed to be about eurozone reform and instead will be mostly about migration. Sunday’s meeting is described as “informal,” and it will not be followed by a statement or news conference, only by questions shouted out by journalists as leaders leave the building sometime Sunday evening. There will be no easy solutions. The number of migrants may be falling, but Europe remains deeply divided over how to handle migration and refugees, where to put them, how to send unqualified applicants back home and even over how to protect its borders. Ivan Krastev, a political analyst, has called the 2015 migration crisis Europe’s “Lehman Brothers moment,” a defining event when the existing consensus ruptured, helping produce nationalist populism and cleavages between the countries of Central and Western Europe. Migration was a key issue in the French, Austrian and Italian elections, and in Germany, too, where Ms. Merkel’s initial “welcome” to migrants in 2015 has backfired politically. It badly damaged her power and made her vulnerable to the political ambitions of the Bavarian leader Horst Seehofer, who is also her interior minister and a vital part of her coalition. Mr. Seehofer and his Christian Social Union face a major challenge of their own from the far-right, anti-immigrant Alternative for Germany party in regional elections in the autumn. The Central Europeans have essentially refused to take migrants or refugees, rejecting the idea of quotas to help reception countries like Greece and Italy. The leaders of the four main countries of Central Europe — Poland, Hungary, the Czech Republic and Slovakia — have not even been invited to the Sunday meeting. And it was only with great trouble that Ms. Merkel convinced the new Italian prime minister, Giuseppe Conte, to come after he objected to an early draft of proposals made by the commission. While the numbers of asylum seekers are way down, the long crisis still threatens one of the European Union’s greatest accomplishments, the “border-free” Schengen zone. Countries have set up “emergency” border checks within the Schengen zone to block uncontrolled flow of migrants and possible terrorists, but those border controls are unlikely to be lifted. Mr. Seehofer’s desire to stop registered migrants from entering Germany would effectively mean setting up extensive new border controls with Austria, now run by a government in coalition with populists that also has decried uncontrolled migration. But this is where anti-migrant policy, populism and nationalism create confused and sometimes contradictory positions. The border would antagonize both Austria and the new populist, anti-migrant government in Italy because it would stall migrants in Austria and mean sending back large numbers to Italy, where many migrants first registered. 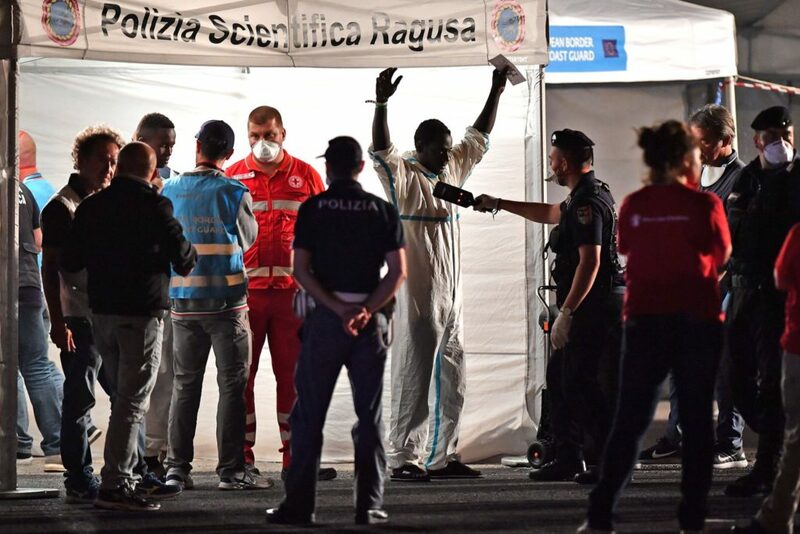 Having taken in some 650,000 boat migrants in the last five years, Rome objects to the idea of asylum seekers having to be returned to the country where they first registered. Mrs. Merkel also fears that such a border would be copied by other countries within Schengen, effectively destroying it, perhaps forever. That is why she is trying to find a broader European solution, even if a temporary one. But the tone is hardening generally toward migrants in Europe, with politicians of many stripes demanding better control over the bloc’s external borders, including as many as 10,000 more European border police. Yet no country seems eager to pay more into the European Union budget to cover the costs. Ms. Merkel is also working on bilateral agreements with partners like Italy and Greece to reduce the burden on Germany, possibly similar to the deal struck with Turkey two years ago. She will also discuss the issue with Spain’s new prime minister, Pedro Sánchez, on Tuesday in Berlin. Spain displayed a kind of European solidarity when it agreed to accept the more than 600 migrants on a ship, the Aquarius, that the Italians turned away.